Over the past eight months, Gembrook artist Belinda Conibeer worked with Selby Primary School and local community groups to create an 11-metre mosaic mural at the Selby Community House. The mural is the backdrop to the Selby Community House amphitheatre and has a local flora and fauna theme. Mrs Conibeer worked day and night to complete the mosaic and told the Mail it was a huge community effort. “We probably put in over 200 hours, so it’s been an eight-month project for me, going to the primary school a few days a week and getting the All Saints Church involved, disability groups and the community…they were all a great help,” she said. The Selby Community House unveiled the project on Saturday 17 November. 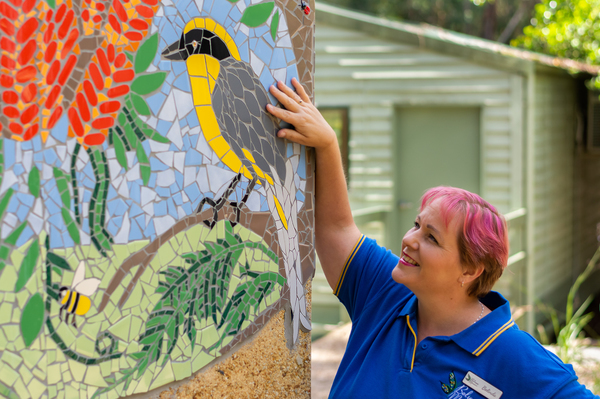 The Minak Reserve is included in the mosaic, and Mrs Conibeer worked with local artist Nikki Wellington on the design to ensure that the flora and fauna that inhabit the reserve were featured. “Nikki was one of my mosaic students and is an amazing artist,” she said. “I can mosaic but I can’t draw, so we sat down and worked out the design together. “We decided to have things that the children and students can see out their window – butterflies, magpies and kookaburras, things that might go past or that they’d see at home in Selby. Mrs Conibeer said it was great to see the mosaic come together after all the hard work everyone had put in, and thanked Tracey Van Vloten, the previous Selby Community House manager, for being the driving force in getting the project up and running. “Hayden and Travis of I4 Tiling helped with the installation and grouting of the mosaic mural, I couldn’t have installed such a large mosaic without them,” she said. “Once it’s done and the grouting is finished you can sit back and see where all the hard work goes. A MUCH better article than the other one. 200 hours may have been Ms. Conibeer alone btw. This is a tremendous undertaking and a very well done. This will last for a very long time -enjoyment and satisfaction for all. Congratulations Belinda Conibeer on another fabulous community project! 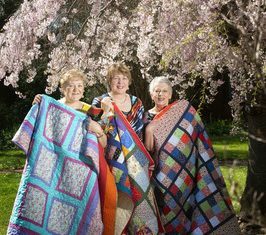 After reading the disappointing article “A magical mosaic”, where the mosaic artist was not even mentioned, it is so rewarding to read this and to see Belinda Conibeer (Beliana Mosaics) recognised in her own right. Well done Belinda, what an achievement, you should be very proud.